This is one of the dishes by which I judge a street food stall. Stuffed calamari with crispy garlic is such an uncomplicated dish to make. And precisely because of that, when it’s done carelessly, it’s obvious. 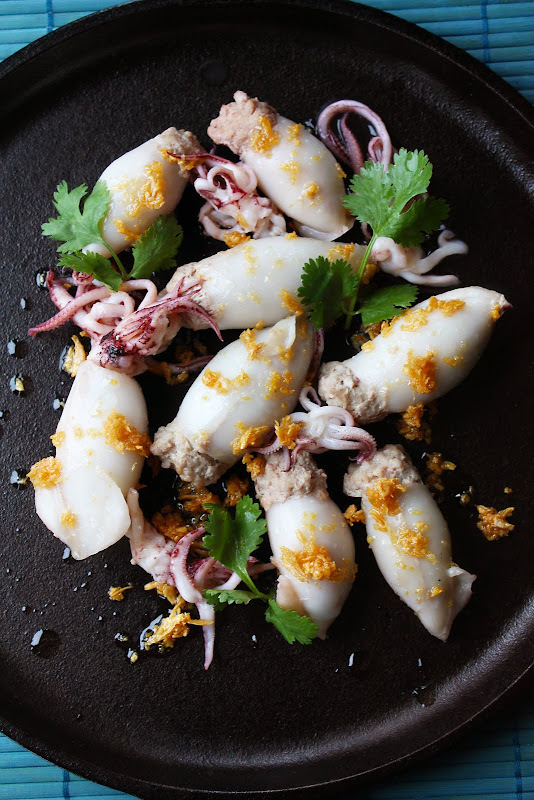 But when it’s done right, you get tender calamari and well-seasoned pork stuffing fragrant of the ubiquitous garlic-cilantro-pepper paste all of which are lightly doused with aromatic garlic oil and thoroughly bespeckled with tiny shards of sweet, crispy garlic. And that’s a very, very good thing. Have these little gems with warm jasmine rice. Don’t forget a little bowl of Nampla Prik on the side. Or you can do what my grandfather liked to do: eat them as an appetizer with cold beer. In a mortar, pound 2 cloves of garlic, peppercorns, and cilantro roots into a smooth paste. Place the pork in a bowl and add to it the prepared paste along with oyster sauce, and fish sauce; mix well. With your hands, stuff the bodies of the calamari with the pork mixture. The stuffing should come up to about 1/4 inch below the edges of the squid openings. (You may have some pork stuffing leftover; freeze it for later.) Note that when cooked, the pork stuffing will ooze out of the squid openings a little. That’s fine. I like it that way. However, if you want the stuffing to stay in, secure the opening of each squid with a toothpick as shown in my post on Sriracha Stuffed Calamari). Place the filled calamari in a heatproof plate and steam them just until the stuffing is almost cooked through. Set aside. In the meantime, crush the remaining cloves of garlic and chop them very finely. Add the vegetable oil and the garlic into a 12-inch skillet and place the skillet on medium heat, stirring constantly. Make sure you start with a cold pan, room temperature oil, and room temperature garlic and heat them all up gently together. That’s the only way you can get your garlic to caramelize slowly and become sweet and crispy at the end. Also, be sure to stir the garlic around constantly to avoid hot spots. Don’t walk away from the pan. In less than 5-6 minutes, you’ll see the garlic turning blond then light brown then light golden. When that happens, remove the skillet from the stove immediately and pour the content of the skillet into a heatproof bowl. Place the oil-coated pan back on the stove and crank up the heat to medium high. Shake excess moisture off the steamed calamari and add them to the hot pan just to sear the outsides ever so slightly. If you have any squid tentacles, add them to the pan at this point. Once you can see that the calamari exteriors are very lightly seared and the stuffing is cooked all the way (this should take less than 2 minutes to prevent the calamari from turning rubbery), douse the calamari with the reserved garlic oil and the crispy garlic. Plate. Garnish with cilantro leaves. Serve. These with a cold beer sound superb! They look incredibly delicious, Leela! This recipe is speaking to me on so many levels. If the fish monger were not now closed for the evening, I’d be forcing my husband to run out for some calamari while I worked on the rest of the ingredients. What a divine recipe.